Palm Springs - land of shopping outlets, mid-century homes, desert sun, old Hollywood and Coachella. Have you ever wanted to see desert animals in their natural habitat? 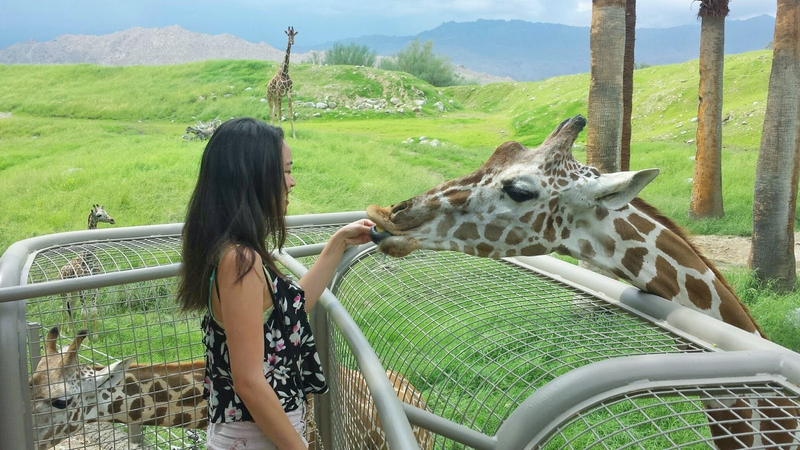 This zoo only features desert animals and desert vegetation and their animal enclosures are spacious with lots of room for the animals to roam (check out the photo below). Plus you can feed giraffes! Admission tickets are a super reasonable $20 each - just make sure to arrive early in the morning before the heat sets in. Pro Tip: If you CAN handle the heat, Palm Springs is dead in September when it's crazy hot out. That's when I went to visit the zoo and there were probably 10 visitors in the entire zoo. It's how I got the giraffes all to myself and animals would come by to look at ME when I passed by, since it was so dead. File this one under "Weird road trip pit stops". On your way in or out of the area, there is a little area by the highway with gigantic dinosaurs. There's really nothing to do there except take pictures of the dinosaurs and go on your merry way, but it's worth a stop if you like to see odd things. It's free to take pictures outside and according to Yelp, not worth the admission fee to go inside. In the middle of the hot, sandy desert lies the world's longest rotating tram car that will take you to the top of the San Jacinto Mountain. Without the tramway, you'd have to do a grueling hike up to the top of the mountain - and according to friends who have done it, it's a challenging all day hike, in the dark, in snow. I'd rather just step onto the tramway and take the 12 minute ride up there to play in the snow, thank you very much. Pro Tip: If you do go up there, bring cold weather gear. I don't care how hot it is on the bottom. It is cold on top and you will need that jacket. There's no shortage of yummy foods. There's too many places and I think Palm Springs restaurants deserve their own post. Basically, go and eat. I don't really like shopping in person or malls, so I can't speak too much to how "good" of an outlet this is. But if you like to work out, there is a Lululemon outlet store out here and I once picked up my favorite sports bra for a measly $15. Win. When I think of Palm Springs, I always picture golden desert sand and blue swimming pools. Pretty much every hotel and Airbnb has a pool. You are in the middle of the desert. Bring your favorite floatie and lounge all day long with a drink in hand.